Yankee Stadium is, arguably, the most iconic sports stadium in the world (the British might vote for Wembley Stadium in London.) The House That Ruth Built opened in 1923 (the Yanks won their first World Series that season); the new stadium opened its doors across the street from the original in 2009 (the Yanks won their 27th World Series that year.) Sustainability was a key facet of the design process and is an integral part the new ballpark’s operational DNA. 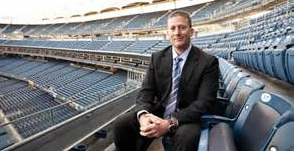 GreenSportsBlog visited with Doug Behar, the Yankees’ VP of Stadium Operations, at his offices in Yankee Stadium to discuss the many sustainable aspects of the Big (Green) Ball Orchard in the South Bronx. GreenSportsBlog: It’s hard to imagine what it’s like to have the responsibility of managing the operations of Yankee Stadium. Before we get in to the green aspects of the stadium, tell us how you got here. GSB: …It does, but I get it–I’m a Yankees fan, too! DB: EXCELLENT! I’m not only a Yankees fan, I was also brought up in the Bronx and dreamt about working in sports. I went to UNC Chapel Hill, majored in Journalism and PR, worked on the Daily Tar Heel, had a sports show on the school radio station…Basically I did whatever I could to learn about the sports biz. I then landed an internship in PR with the Kansas City Royals*, eventually got introduced to someone at the Yankees. That led to an internship with the Yanks at the end of 1997 and a full time job in marketing 3 months in. GSB: WOW!! What a great time to be with the club? GSB: …Did you have any background in operations? DB: No, but it turned out to be my calling–I just had no idea that was the case at the time. I’m just wired to be in “ops”. GSB: What kind of wiring does it take? DB: It’s about controlling chaos yet being strategic. It’s both front facing and behind the scenes. And you’re managing a billion dollar facility that’s world famous, larger than life. It’s a trust that I take very seriously. GSB: And you were operating Yankee Stadium during a great, exciting era. DB: No doubt about it! 3 World Championships in a row (1998-2000). Playoffs every year except 2008. I worked hard but I was also lucky. My boss left in 2005 just as the new stadium was announced. DB: No question about it. Of course, fans had tremendous affection for the old place–we had to honor that, while getting ready to close it up, build the new place and move in. GSB: As a Yankees fan, I have to tell you, I had mixed emotions about this. DB: You were not alone. But, when we opened this new ballpark in 2009 by winning the World Series, that put away a lot of angst. GSB: Indeed it did. OK, let’s turn to the environmental aspects of the new stadium. 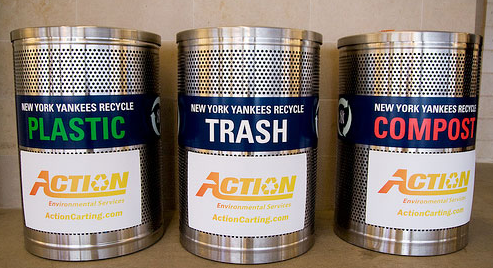 The Yankees didn’t go after LEED Certification during the design process. How come? DB: Well, we looked at LEED as more of a check-the-box type of thing. We’d get a plaque for the building but that wasn’t what our greening, our sustainability efforts were about. That attitude comes from ownership. George [Steinbrenner] didn’t look for credit in many of his good charitable works. And LEED just seemed showy. DB: Oh yes. In the construction process, we used recycled steel and concrete aggregate. In fact, we diverted 75% of construction waste–either it was recycled or reused. GSB: What about on lighting? GSB: My guess is those our now obsolete in some sense? DB: Funny story: The Green Sports Alliance honored us for green work in 2015. This came two weeks after we announced that we’ll install LED lights for the 2016 season. They will be 50% more energy efficient than our old energy efficient lights. GSB: Congratulations! Did you go state-of-the-green-art in other ways as well? DB: Yes. Our building energy management systems were top of the line in terms of efficiency. All of our appliances are Energy Star rated. We recycled and composted from the get go, when the latter was not in vogue. GSB: So what was the Steinbrenner’s motivation behind building and operating, with apologies to the late sports talk radio host Arthur George Rust, Jr. a Big Green Ball Orchard in the South Bronx? DB: It sounds simple, but they want to do the right thing, be a positive example for our community, our borough, city, and Major League Baseball. GSB: What about cost savings? DB: Exactly. Thing is, it’s not cost effective for us, at least right now. But, it’s the right thing, plain and simple. GSB: What do you do with unused food? DB: We work with Rock and Wrap It Up, a great organization, to donate unused food to the homeless. We also take our cooking grease and donate that to a company that turns it into bio-diesel fuel. GSB: How do you communicate this to fans? Because, as someone who’s very aware of both the green world and Yankees world, I was unaware of a lot of what you’ve told me so far. GSB: …It’s not the “Steinbrenner Way”, as you mentioned early. But, in this case, wouldn’t shouting out good environmental behavior be a good thing? DB: I’ll tell you, with our recycling/composting efforts, we haven’t had to shout it out. The fans want to know what to do. They’ve told us they want to do the right thing. We needed to make the recycling and composting system easier and clearer for the fans to navigate. And now that we’ve done that, the fans easily put their waste in the correct bins, which, by the way, are made from recycled materials. GSB: Wow, talk about closing the loop…Speaking of composting, I know that finding places to haul the compost from the Bronx is a complex, challenging task. How are you dealing with that? GSB: Similar to that of the Cleveland Indians, right? We wrote a story about their anaerobic digester program awhile back. That’ll mean you will essentially be composting on the property. Very cool. Now, with all that the Yankees are doing, have you gone about measuring the team’s and/or the stadium’s carbon footprint? DB: Not yet; that’s on the to-do list. In the meantime, all of the electricity we’re purchasing is green, from non-polluting sources. * Congratulations to the very deserving World Champion Kansas City Royals!